Rushing through a trip to the grocery store, I didn’t pay close attention to which bag of grapes I picked up–just selecting one in the front with giant red-purple grapes. A new episode of “How I Met Your Mother” was waiting on my DVR at home, so obviously, I had to get back quickly. Into the cart went the grapes, then the shopping bag, and then the fridge, and onto the couch I plopped. The next night, rinsing off a few to eat discreetly during a late meeting, I popped one in my mouth to be sure they were sweet. And they were. But yikes–seeds! Who actually buys seeded grapes? They seem to be a danger to the casual grape-snacker who likes the convenience of the bite-size fruits. No snack bag was packed in my purse for that meeting, but the challenge was on–I knew I had to find some other way to use up the grapes aside from just tossing them back, and I certainly didn’t want them to go to waste. Salad became the answer. Slicing the grapes into halves and quarters is tedious, but seems to be the most foolproof way to rid the grapes of their pesky seeds. Like most salads, this is a flexible recipe. You want a few components that keep the meal interesting: sweet fruit, crunchy nuts, soft and tangy cheese, a bite from the onion, and a dressing to pull it all together. 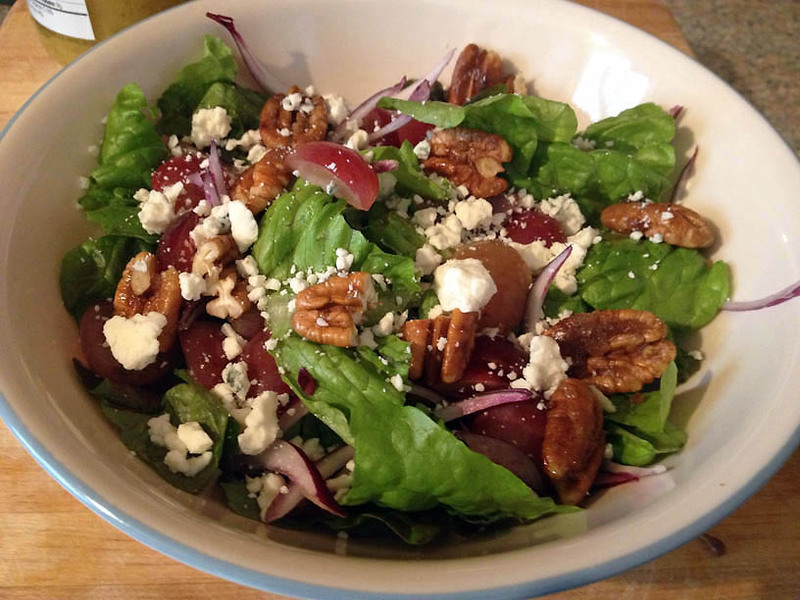 Add chickpeas if a container is hiding somewhere in the fridge; make a decadent sugared pecan or leave them plain or trade-in your other favorite toasted nut; swap out the blue cheese for goat and feta; or completely lose the onion. Change up the fruits with what you have on hand–cubes of apples or pear are other nice choices. Dressings can be simple–lemon juice and olive oil, perhaps–or go with a nice vinaigrette, like this Meyer Lemon Vinaigrette that my mom makes each winter. A large serving of this salad can easily be a meal by itself, especially if you add some beans, or have bread on the side. Or, try the simple nut-fruit-cheese combo for a side for Thanksgiving, for it’s always nice to have something green and light on the table. We’re going with some green vegetable, along with my favorite tomato-artichoke dish. 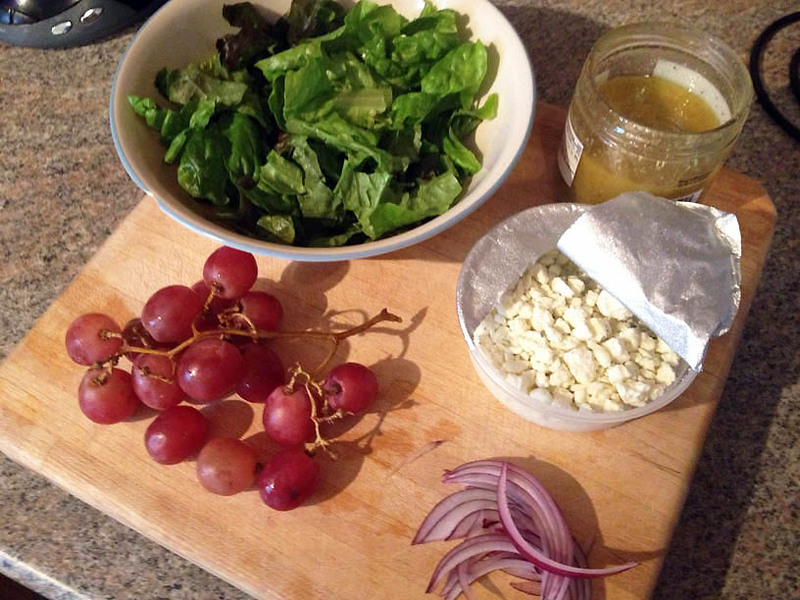 Fill a bowl with salad greens, torn into bite size pieces. Slice the grapes if they’re unusually large. Add the grapes, onion, blue cheese and pecans to the greens. Toss with dressing and enjoy. How to make sugared pecans: If you want the pecans to be extra special, melt a pat of butter in a pan and add a spoonful of brown sugar. 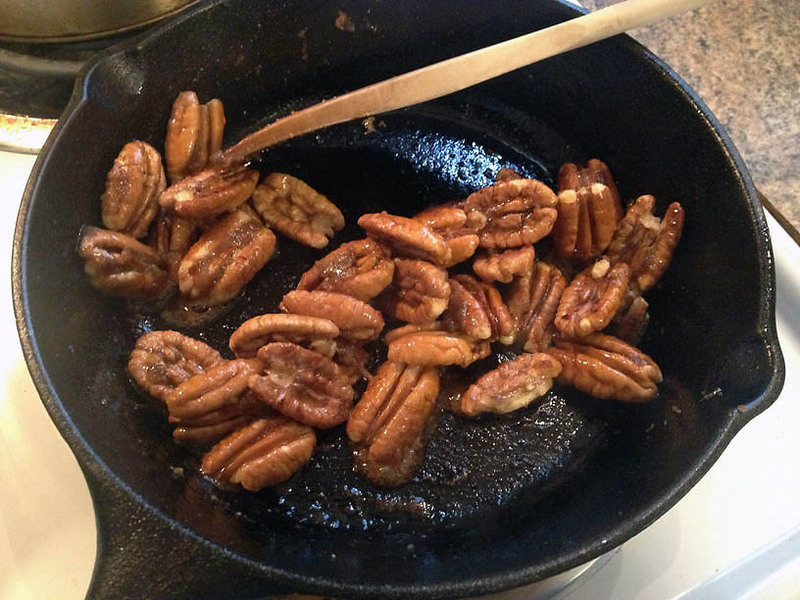 Add a pinch of salt, a sprinkle of cayenne or chili powder if desired, then add the pecans. Stir and cook for just a few minutes over medium heat until they’re just coated and the nuts are slightly toasted. Be careful not to burn. Let cool, put some on your salad, and snack on the rest. Combine all ingredients except oil in a blender. Pulse a few times to chop garlic thoroughly and mix ingredients together. On low speed, slowly add olive oil in a steady stream, until the mixture has emulsified to vinaigrette. Taste, and adjust flavorings. (We added more dijon mustard.) This recipe makes a lot, so share with a friend, or plan to eat lots of salads for the next few days. Thanks! It helps me to have a guideline for how to mix up filling salads.